The birth of a baby is a common thing, something that we probably all experience in some way during our lifetime. We know the specific feeling of celebrating a new life and adoring a child. As the first scene of Jesus’ life on Earth it should actively inspire reflection and wonder, emotions far beyond the everyday and the physical. How does an artist overcome this, to depict a scene so paradoxically ordinary and holy, and create a powerful image of religious importance? That line between relatable and familiar, and untouchable and incomprehensible really interests me. Like the humble shepherds and kings, we are mere mortals in the presence of something of enormous importance. We can be included in the scene or totally removed from it. Time can be warped to either evoke an age long ago, or the dress and background can be interpreted in a modern way to bring the story into a different place. Bible stories in visual form can have the massive advantage of not being required to tell the whole story, as a viewer we are expected to know the details, leaving the artist free to pour emotion and drama into a single moment. We also know how Christ’s life will unfold, the trials and tribulations that lead him to the inevitable crucifixion, and also the legacy that will be his life, and this adds to the gravitas of the artwork. A key question for artists was how to paint Christ as a baby, a deity in human form, a new and innocent being that is to become the Saviour? 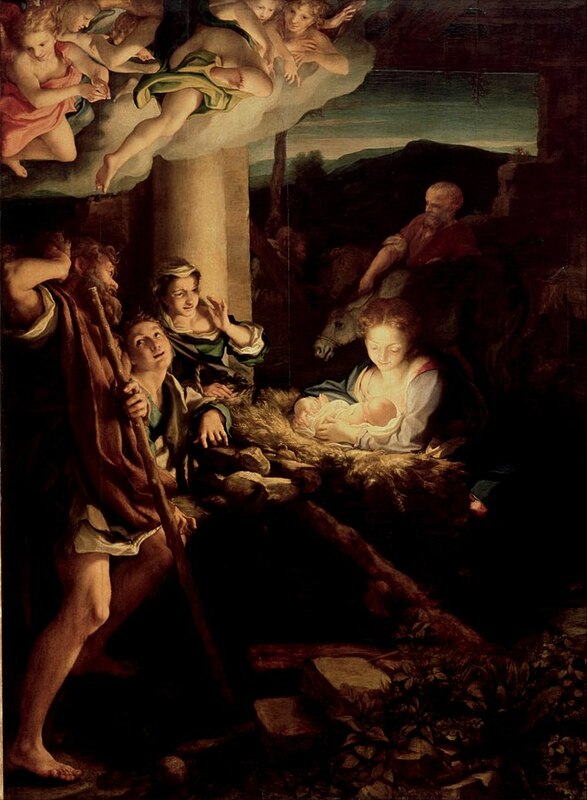 Correggio has cleverly posed the baby Jesus so that we cannot see his face, and instead used light to mark out the Virgin and child. Cocooned by his mother they are both bathed in the divine golden glow that he emits. Mary looks down on her baby, engrossed in love and complete contentment. It is almost as if the background is totally superfluous to the composition, it all dissolves away around the new mother and her baby. In this way the artist fuses the sacred with the familiar. Humanity, above all is what I think artists were trying to express in paintings like this. It is a theme that can unite us as viewers, religious or not. I love the realism in the hands of the Virgin and child. Her right hand tenderly plays with his foot, while the baby Jesus stretches out his tiny tapered fingers. The figure in the middle of the three on the left expresses that admiration that is unique to beholding a newborn. Everything is serene and it is as if the everything has stopped for a moment to absorb the holiness of this maternal scene. The extreme chiaroscuro focuses our eye as well as expressing the religious importance of what we are witnessing; the birth of the light of the world.